With each new year comes new fads and styles, and the world of bathroom design is no different. It’s important for our designers to stay up on all the new trends, colors, textures, materials, and styles that emerge into the mainstream—and it’s even more important to know the difference between a fad that will go out of style in a matter of months and a trend that will be popular and en vogue for years to come. Neutral is always a safe and timeless choice. While many new fads are leaning toward bold, dark bathroom trends, there’s nothing quite like the light, clean, open feeling of a neutral color palette. Whites, grays, tans and lighter earth tones are a no-brainer when it comes to laying the foundation, while allowing you to use a bold pop of color for accents. Once you lay the foundation with your neutral palette, choose a bold accent color to make your statement! Blue shades aid in relaxation, while greens allude to a feeling of nature and wellness. Or add a bright orange for a more energetic feel—the sky is the limit! You can implement a pop of color with hanging art, furniture, an accent wall, or something as simple as the color of your towels. Subway tile is the polished ceramic tile that reminds you of a subway station—usually rectangular and brick-like in appearance. Subway tile has been a popular material for a while now, but the new trend is to use different sizes other than your standard 3×6” tile. Larger subway tiles like 4 1/4 x 8” or even 4×12” are becoming more and more in demand, and coupled with a variety of colors, designs, and grout color choices…the possibilities are virtually endless! We’re seeing a departure from the standard bathroom cabinets in favor of furniture-style cabinets or even wall-hung cabinets. 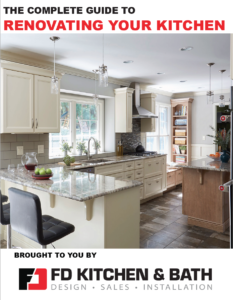 Cabinets that look like a piece of furniture elevate the look of the room and make the space look more custom. In addition these furniture pieces can surprisingly house a lot of storage. 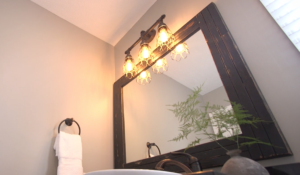 Wood accents can add a touch of traditional style to an otherwise modern or trendy bathroom, bringing in a touch of classic to tone down the “new.” Use wood accents for shelving, cabinets, towel hangers, or create a wooden accent wall. 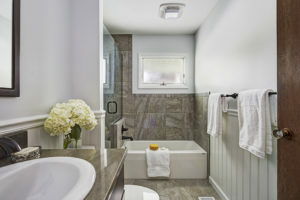 Some trends are pushing for exposed metal pipes and plumbing in bathrooms, but we think that will die out soon enough. The opposite, however, will be a long-lasting design trend for years to come: shower enclosures showing as little metal as possible. It’s rare to see a new bathroom with big clunky metal shower door frames. Most customers are opting for custom frameless glass shower enclosures that have as little metal fastening and framing as possible. Say goodbye to that old “stuck on the wall” mirror. One of the most popular trends—and one of the easiest to include in your bathroom—is the use of decorative mirrors. The key here is finding the right mirror to work with the rest of your design. If you don’t know what you’re looking for, it’s always best to ask for some direction from a pro. If you’re excited about the prospect of creating a stylish new bathroom for your own home, CONTACT US for a free consultation! Our expert designers will sit down and discuss your ideas and budget, and create a beautiful new space for you and your family!